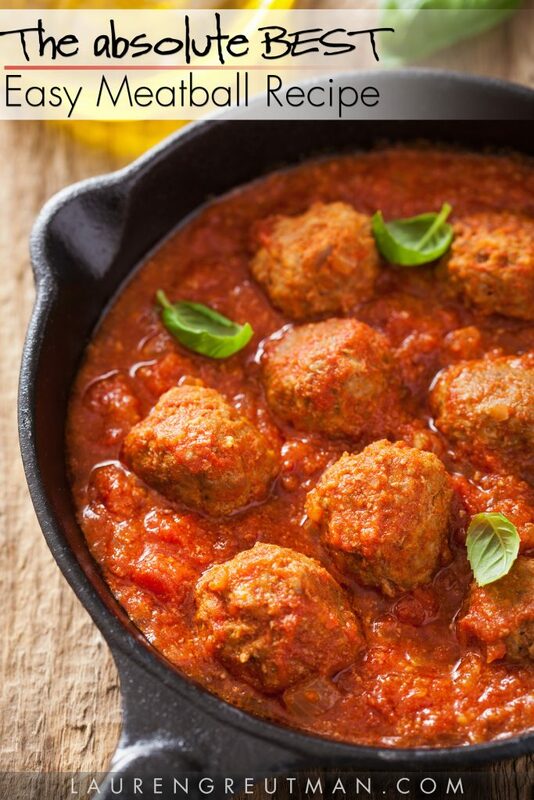 Looking for an amazing and easy meatball recipe? You gotta try these. PERFECT. The seasoning is spot on. The texture is just how you like it. They are easily cut with a fork, but they won't fall apart if you decide to cook them in sauce for a couple hours. Just make sure to use an awesome homemade spaghetti sauce with this easy meatball recipe! I've looked and tried several easy meatball recipes online. Some use a mix of beef, pork, and maybe veal. That doesn't sound too easy to me. To be honest, there's no reason to. Do yourself a favor… save time and money by just using 80/20 ground beef. It took me a few tries to get the ratio of meat, breadcrumbs, and parmesan cheese right. 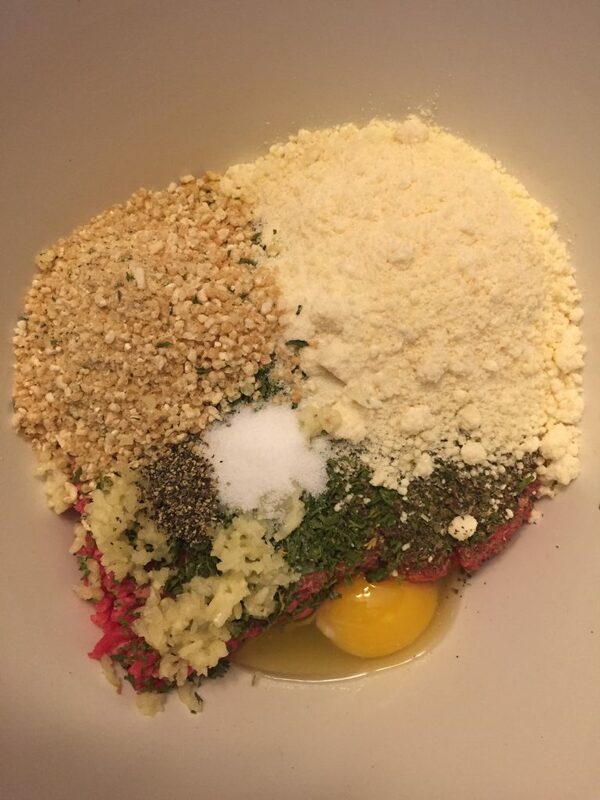 I arrived at 1/3 cup of breadcrumbs, 1 tsp of salt, and 1/2 cup of parmesan cheese for each pound of ground beef. This results in the perfect texture and perfect level of saltiness. Also add in some garlic, pepper, basil, parsley, and an egg to keep it bound together. This is a very easy meatball recipe. But it is pure perfection. But one of the keys to getting this just right is to mix all of the non-meat ingredients first in a bowl (which I didn't do in the picture above). I usually whisk them together. Then add the meat. Mix it all up just enough, but not so much that the meat is overworked. Once you make the balls, you can either fry them in oil (they get a nice crust on them if you do it this way), or you can just bake them. I'd also recommend tossing them in a nice sauce and simmering for a couple hours. They get REALLY nice if you do it this way. In a bowl, combine everything except the beef and mix well. Form small balls of the meat and place on a cookie sheet. Bake at 400 for 15-20 minutes (this could be longer or shorter depending on the size of the meatballs). Place the meatballs in the sauce and simmer for at least a half hour. These came out great! I even stuffed mine with American cheese. Ooh – stuffed with cheese. Those sound amazing! This really is the BEST and easiest meatball recipe. I by a meatloaf mix from the store as my meat and I fry the meatballs before simmering in the sauce. The spice mixture is so easy to put together and is super tasty. I use gluten free bread crumbs to make this dish gf and I’m thrilled to have this recipe in my aresenol. Could I substitute ground turkey? Yup 🙂 I’ve done it myself. 2nd time making these! They have become my go to recipe for easy & delicious meatballs !!! I would say Perfect,Perfect Meatball! I made my own sauce and was ready to make the meatballas,,,,,I thought why not try something new?Did not tell hubby as he loves my meatballs the way they are.I waited for his reaction.And waited.When down to last bite he asked where did I get this recipe?I said from Lauren.He says well she must be Italian because these are really good!Truth is, he is Italian and his mom taught me how to make her mom’s red gravy and meatballas!Thank you for everything Lauren,I will be making your sauce next Sunday! Is it okay to leave out the cheese? Can you please specify the quantity of Parmesan cheese in ounces … that way I can grate my own without ambiguity. I don’t like fresh garlic,is there a substitute for it? I know it won’t taste the same. Try garlic powder. Kitchen staple. This is actually the best meatball I’ve ever tasted. Thank you so much for sharing the recipe. Can you help me adjust the recipe to serve 100 people? Umm can’t you estimate yourself? How is she supposed to know that? I made them 1-2 inches wide and got 12 out of 18 ounces worth of ground beef. That would take about 30 pounds of burger. So, 30 times the other ingredients also. I would probably do it in 10 pound batches to keep the mix consistent. Thanks so much for this recipe. I too added mozzarella cheese in the middle and let them simmer in sauce after baking. Turned out perfect! The BEST meatballs! So yummy and so easy! I use shredded parmesan cheese and shredded Swiss cheese and Pako bread crumbs. After baking the cheeses melted out but stayed with the meatballs when dropped in the sauce. Only change the family enjoyed. Good recipe. I just used this recipe for my dad’s health issues and fussyness, but tweaked it quite a bit. They came out fantastic! Best all beef meatball recipe I have ever made. My family loved it! My family wanted me to find a recipe that didn’t taste like meatloaf. I found it! It was simple to make and there were no onions to chop. It was easy and delicious. It’s a “keeper”! I have basically used this same recipe for many years. I soak my breadcrumbs in a bit of milk and it makes the meatballs even more tender. Excellent recipe. Delicious. Are dried bread crumbs used, eg, Italian style, or does this recipe call for regular bread? I neither bake or fry my meatballs, but just toss them in the simmering pot of homemade sauce. They cook nicely and don’t fall apart. Your thoughts. You can stuff them with fresh Mozzarella cheese too!! Yum!!! I made approx. 24 with the 1lb beef recipe. For 100 meataballs i would do 5 lbs and 5× the ingredients. But then again thats for a normal sized meataball. How long will it take to make these from start to finish? I have a 3 hour window. Will that be enough to simmer the meatballs in? My granddaughter didn’t have any bread crumbs so she took garlic croutons and put in a baggie and smacked them down to crumbs and use those. Awesome meatball. She used turkey instead of hamburger. She also had the mixer left over so she crumbled up the left over to brown in the pan and added spaghetti sauce so u had meatballs and the loose of the same flavor in the spaghetti itself. I made these tonight and they came out so good! Your recipe is very easy to follow and it tastes very Italian. Not only did me and hubby enjoy them but so did my 2 year old! Adding this recipe to my dinner rotation. Thanks! 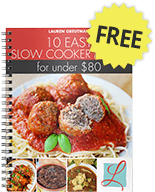 I’m embarrassed to say that I am in my 60’s and been screwing up meatball recipes for years. My dear Mother in Law made the best meatballs and the recipe is exactly the same as yours. Why I ever deviated from this recipe I will never know. When I made these my husband said, what did you do? These meatballs are great! Thank you for posting this. Sunday is Sauce and Meatball Happy Day again! I used instant potatoes instead of bread crumbs. I didn’t feel like toasting and grinding bread. It took about 20 minutes to gather ingredients and construct the meat balls. 1 pound of 90/10 ground beef resulted in 18 meatballs. Next time I will add a touch of olive oil to replace the low fat content. I will also up the salt a pinch more. Everything else was perfect. After simmering in home made tomato sauce for a little over an hour everything was tender and flavorful. Served over some classic spaghetti this these meatballs are great.